YOUR NJ PATIO & MASON SUPPLY SPECIALISTS! Serving Sussex County, New Jersey and surrounding areas since 1976! 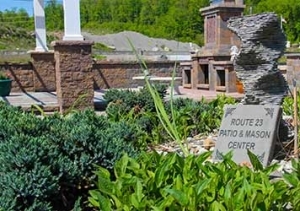 Route 23 Patio & Mason Center in Hamburg, New Jersey offers a wide selection of high-quality hardscape and landscaping products. In 2007 Route 23 Patio & Mason Center partnered with Athenia Mason Supply, allowing us to serve more customers across the Tri-State area. For more than 40 years, our family-owned-and-operated business has been your primary source for natural and manufactured stone, concrete pavers, gravel, and more! Our products are available to both contractors and homeowners, and help complete your project from start to finish. At Route 23 Patio & Mason Center, we know that every home, commercial, and garden project starts with one thing: quality supplies. It is our goal to help you bring that vision to reality. Whether your job is new construction or renovation of an existing structure, we are here to help. We proudly feature an extensive inventory that is affordable and always being updated to include the latest products on the market. Our knowledgeable staff is here to dedicate their full attention to your needs. We pride ourselves on offering you the Best & Friendliest Customer Service! Talk to a Route 23 Pro today about your project! Enhance your patio and create a beautiful oasis for family and friends to enjoy in your own backyard. Stone veneer creates an immediate and lasting impression of permanence and beauty to bring your vision to life. Fireplaces add elegance to any indoor or outdoor living space. Choose from fully assembled units & prepackaged kits, or build from scratch. We have all the materials you need to get the job done. Find the perfect paver choice for your walkway, patio, pool deck, or driveway!